Normally I don't buy the same style in different colors but I love the style so much I feel I will regret it if I don't buy all the colors. Colors available are white, blue stripe, dark blue and blue plaid. I didn't buy the dark blue but that could change. At $24, I just can't go wrong. The cotton material is sooooo comfortable. It washed really well; the shape didn't change at all. The piping detail and collarless v-neckline are stylish and casual, which is perfect for moi. Many gal pals saw my shirt and they ran out to buy one too. I have been wanting to find a white blouse with v-neckline for a while after seeing gal pal in a white blouse by Faconnable. This is the style by Faconnable. I really like the ruffle detail and collarless v-neckline. I adore this style but I don't adore the price at $175 to $185. It came in dark blue, white, plaid, and blue stripe as well. Do you buy different colors in the same style? Yepp, absolutely must have pieces! So versatiles! Sometimes. I definitely do with cardigans I really like. I thought the plaid one looked great on you in yesterday's post. And I love the light blue stripe and the white as well. The detail in the front of the shirt gave it a very feminine touch. These are great bargains! I might have to run to the store and get a couple myself! Thanks for the post! 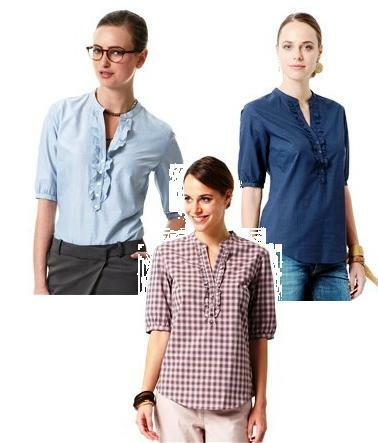 Tunics are wonderfully versatile. I don't blame you for stocking up! they are wardrobe essentials. easy to match and comfy. At $24, I probably buy all the colors too. Very cute--and they all look so different.